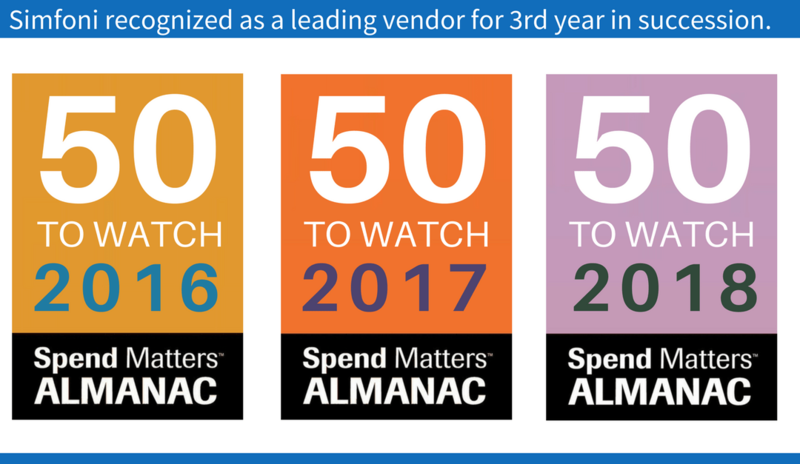 The Spend Matters 2018 Almanac has been released today and Simfoni is delighted to announce that – for the 3rd year in succession – it has been recognized in the “Top 50 to Watch” category amongst leading technology vendors in the eProcurement sector. The Spend Matters Almanac is truly the Who’s Who of technology companies in the procurement industry and, for many, the Top 50 to Watch offers a selection of the up and coming players that offer potentially the most disruptive solutions for the next era of Procurement innovation. The Almanac listing comes hot off the heels from Simfoni’s inclusion as a leader in the Spend Matters Solution Map for Spend Analytics published in March 2018. Simfoni is a leading technology provider for spend analytics and tail spend management. Simfoni’s Vitesse Tail Spend solution is a purpose-built platform blending buying automation software, vendor & pricing content and category expertise to help organizations to significantly reduce non-core expenditure, reduce the cost of managing it as well as improve the end user experience, increase transparency and reduce vendor risk. Simfoni’s Virtuosi Analytics solution is a data analytics platform combining process automation with smart algorithms to help organizations to derive opportunities for operational improvement in the area of procurement and supply chain. Simfoni has regional headquarters in Chicago, Dubai, London and Melbourne.